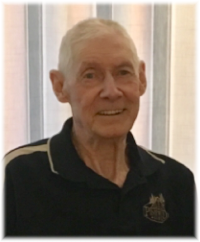 It is with heavy hearts we announce the passing of our beloved husband, father, grandfather and great grandfather, James Gardiner, on Friday, April 6, 2018, at the age of 86 at the Whitemouth Personal Care Home. James will be dearly missed by his wife Dolores, with whom he just celebrated his 65th wedding anniversary with on March 14, 2018; children Deb (Bob), Laurie (Denis), Rick (Val), Marilyn (Chris) and David (Cathy); 11 grandchildren; 7 great grandchildren; and numerous nieces and nephews. James loved going to the cabin at Dorothy lake where he would fish and spend quality time with his family. His grandchildren held a special place in his heart and he was blessed with great grandchildren. James was always ready to lend any of us a helping hand. Thank you to home care and the staff at Pinawa Hospital and Whitemouth personal Care Home for Dad’s awesome care. Cremation has taken place and a celebration of life will take place when his wife joins him. My thoughts are with you Dottie and your family, I was so sorry to hear of your loss. God bless you all.